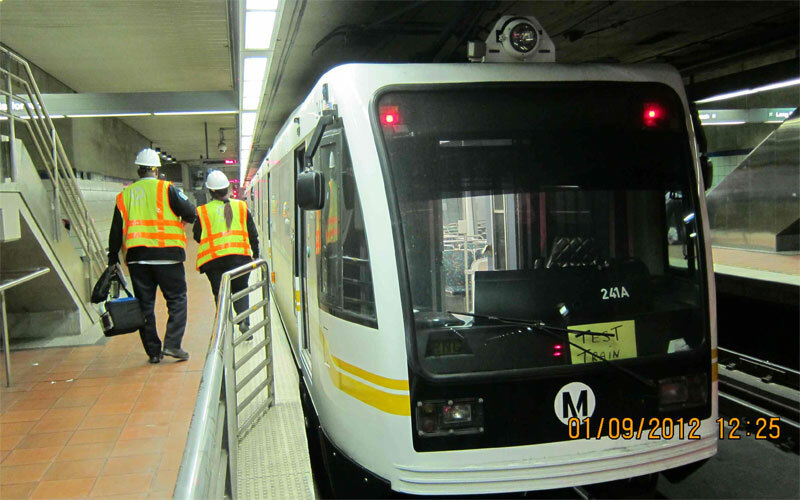 1/9/12 — A test train crossed Washington to and reached 7th Street-Metro Center station for the first time (The Source - Metro photo). 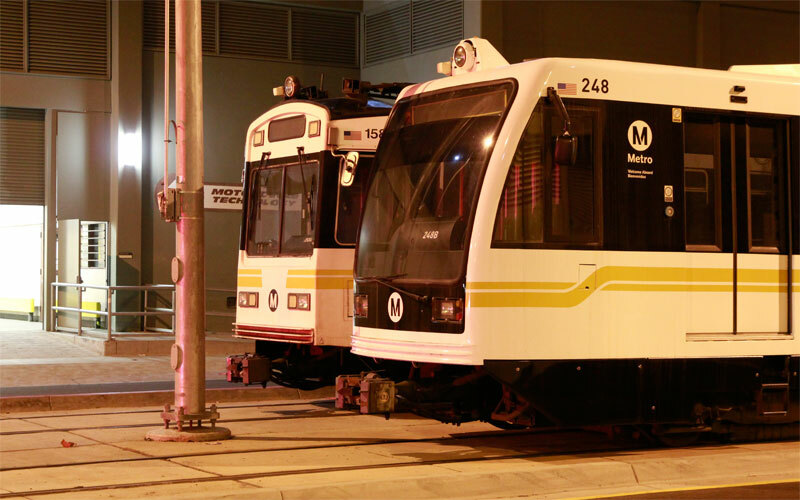 12/9/11 — Two test cars are parked south of Washington, above, while the remaining ones are testing between 23rd and La Cienega stations. 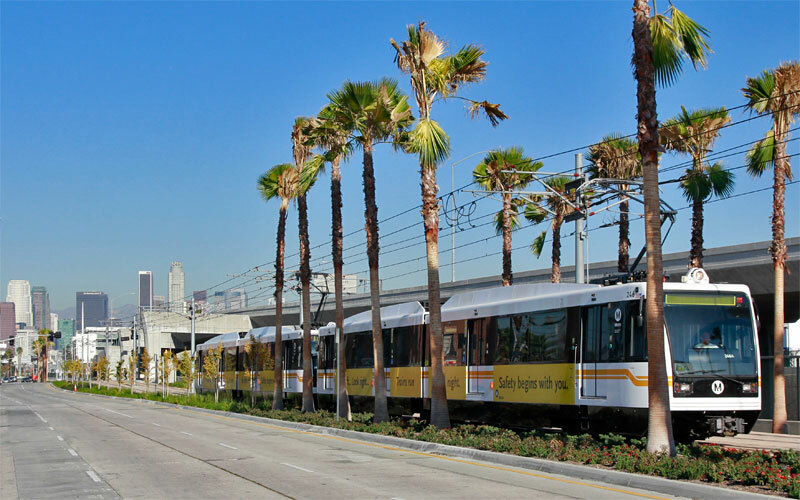 Below we see a southbound train approaching Jefferson station. 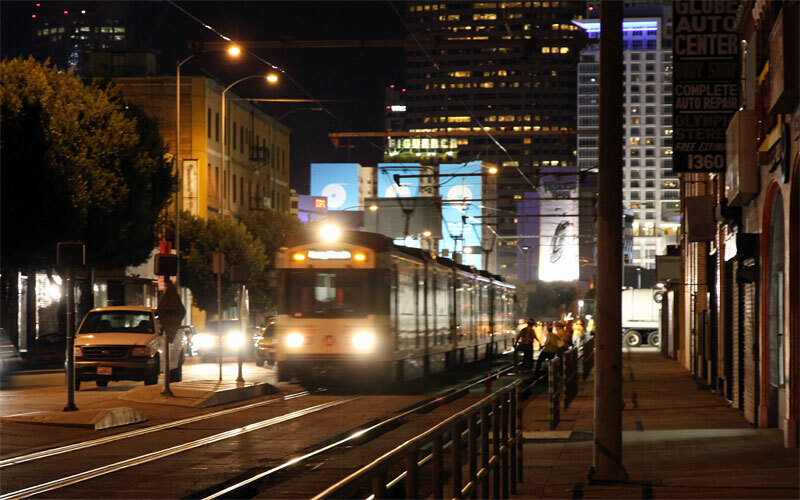 11/3/11 — Striking lighting for a test train at 23rd Street station. 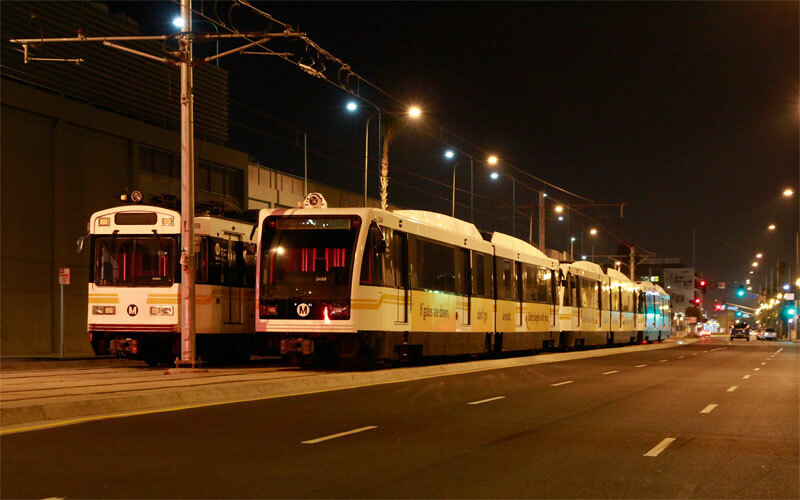 10/26/11 — Test trains — six Siemens cars and one Nippon-Sharyo car — are parked overnight on Flower Street by Trade Tech. 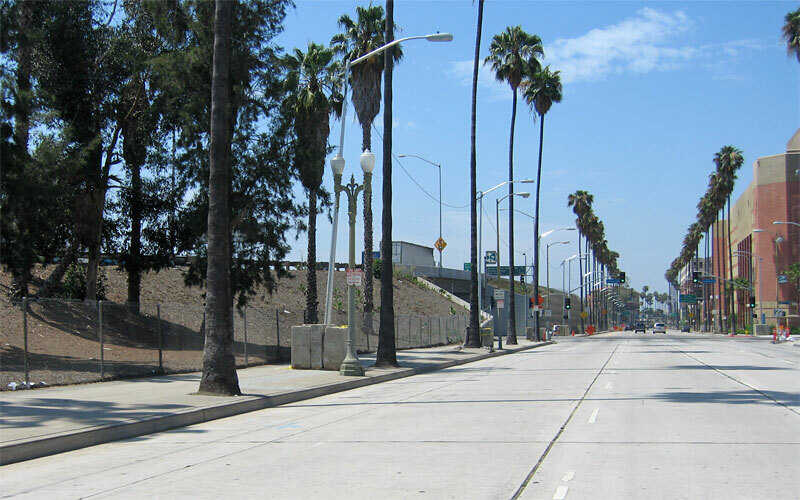 7/8/11 — Landscaping is pretty finished along Flower Street and looking nice, above between Venice Blvd. 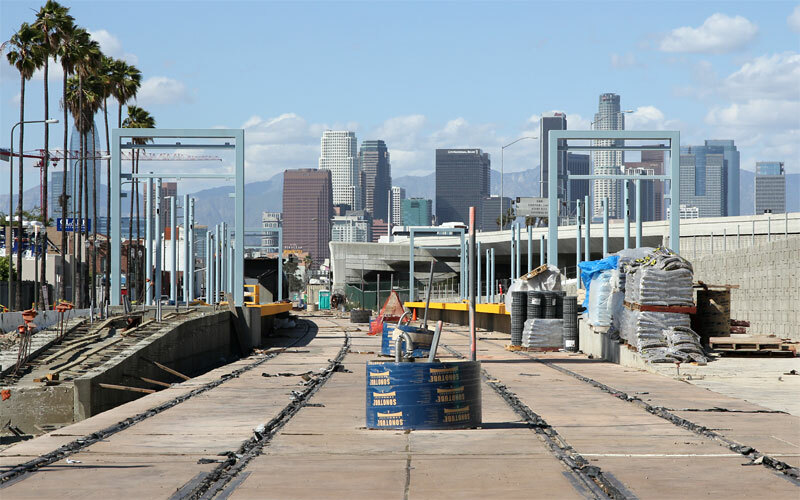 and the I-10 freeway bridge on the existing Blue Line, and below at the 23rd Street station. Compare with the Expo illustration at the bottom of this page. 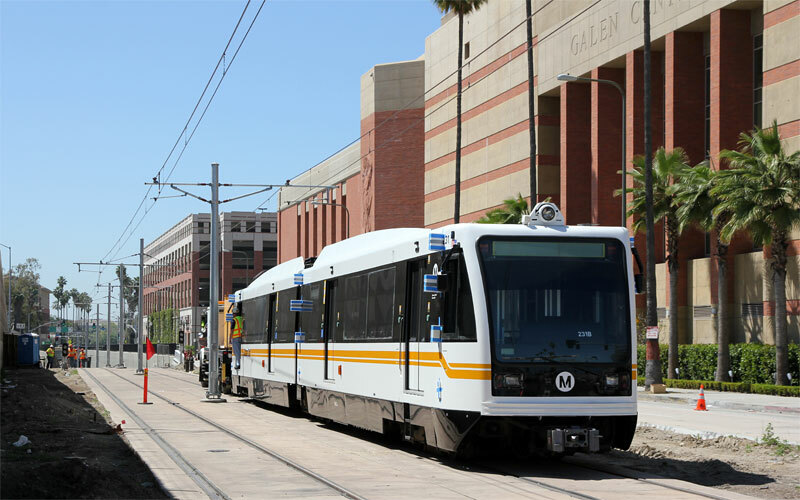 The train stopped for media interviews on the Jefferson station platform and on the train (above; note the blue news van). 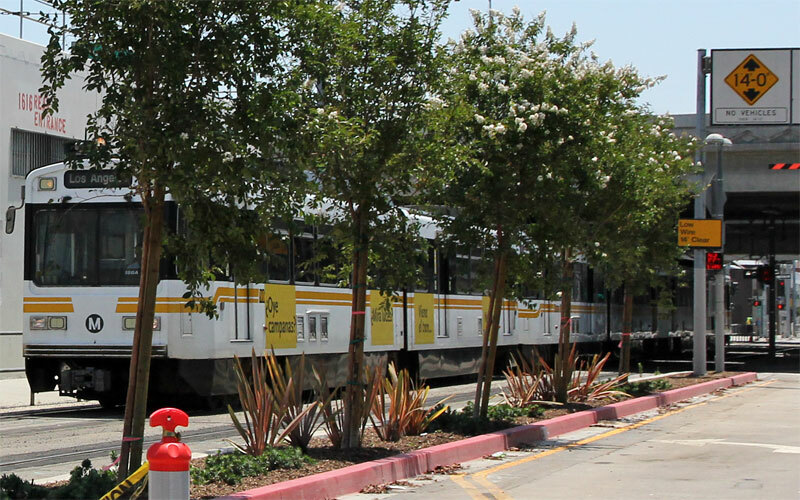 Also note that these station platforms are curved. 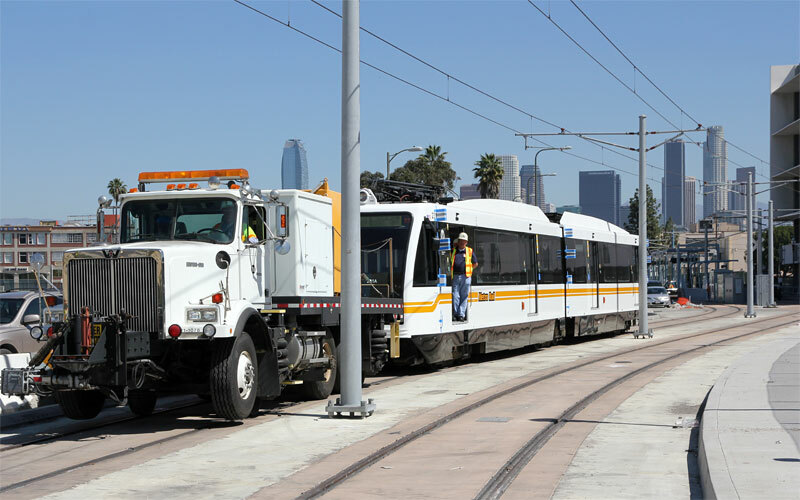 Flaggers stop traffic at each crossing for this test train. Heading by USC's Galen Center toward the underpass at 12:15 a.m. (below), this is the very first view of what will be a completely common sight. 3/18/11 — Ginkgo and palm trees are being planted along Flower Street. 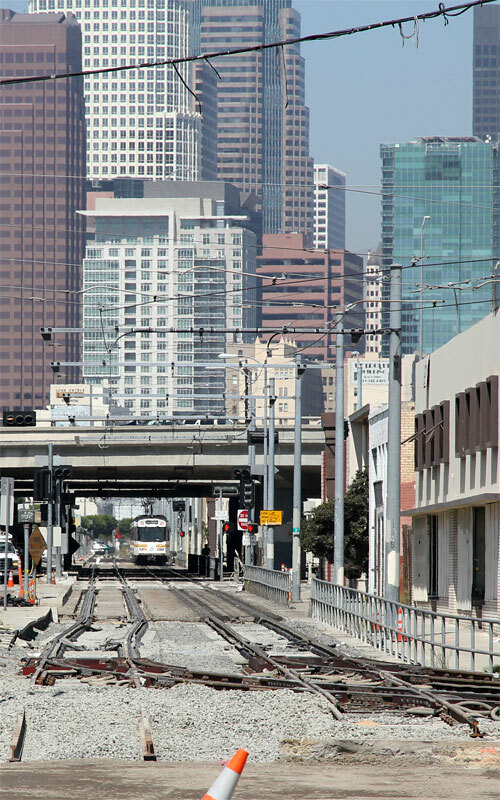 This will be a very photogenic view when trains are running! 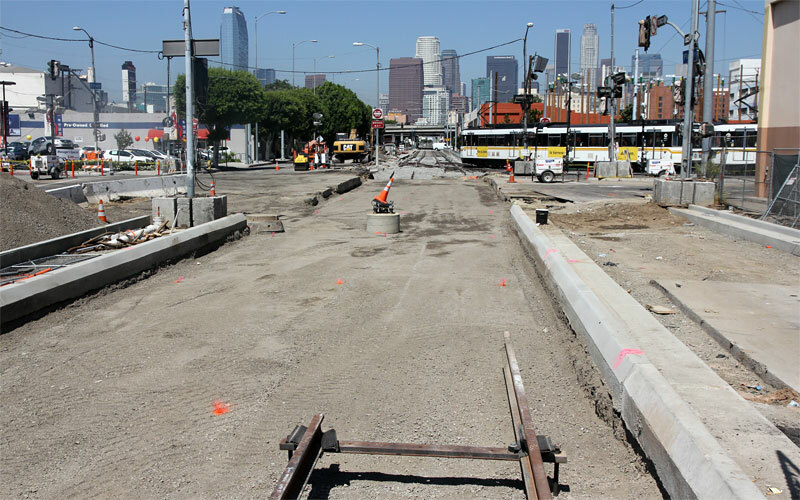 1/30/11 — Curbs are complete for the curbs between the Blue Line tracks and Flower Street traffic lanes (above). 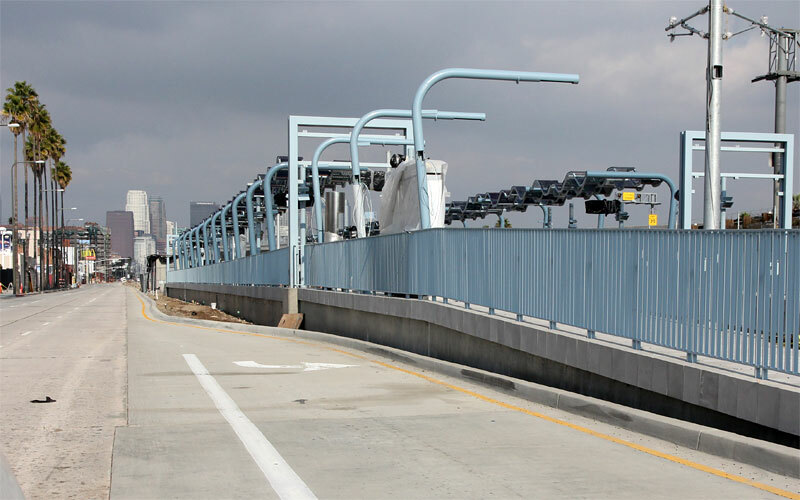 Most of it appears narrower than the design sketch. 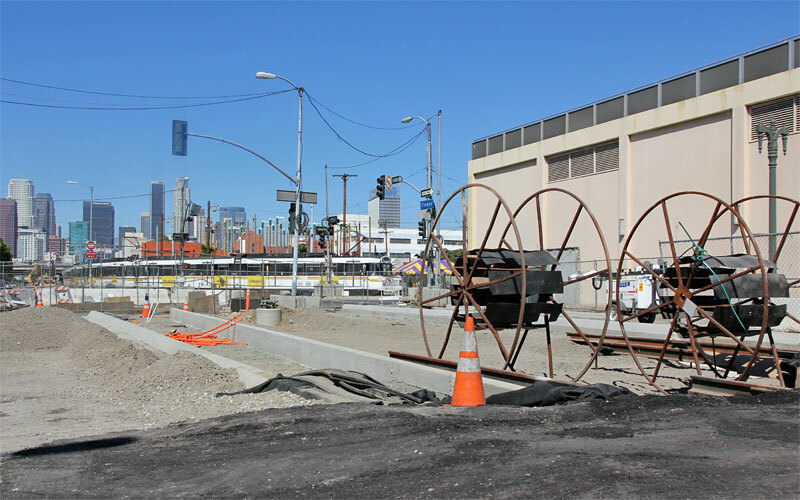 Detection loops are being installed north of Venice Blvd. (below). 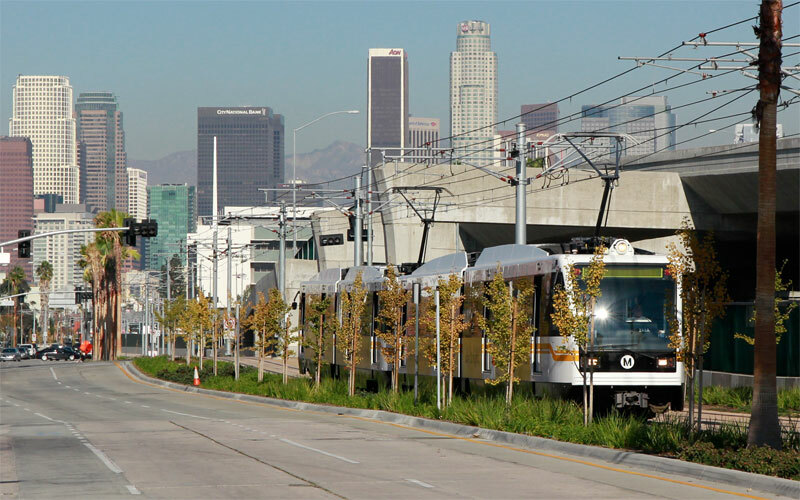 Washington Blvd. 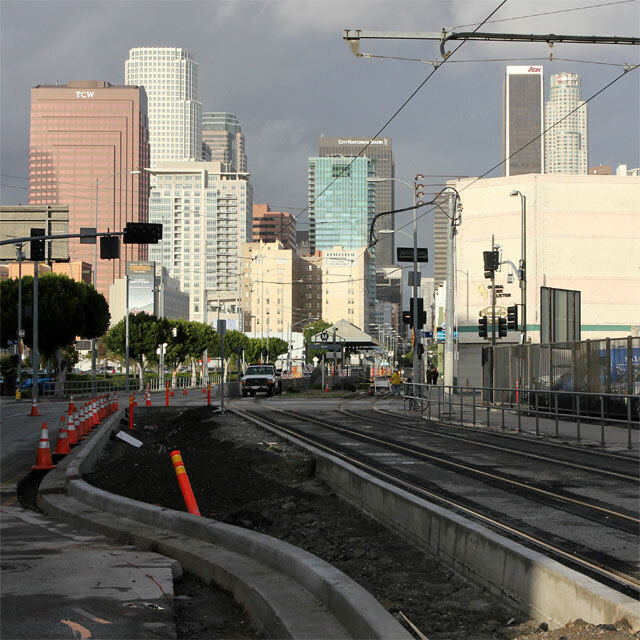 has new curbs and gutters, but is othewise very much still under construction (above). 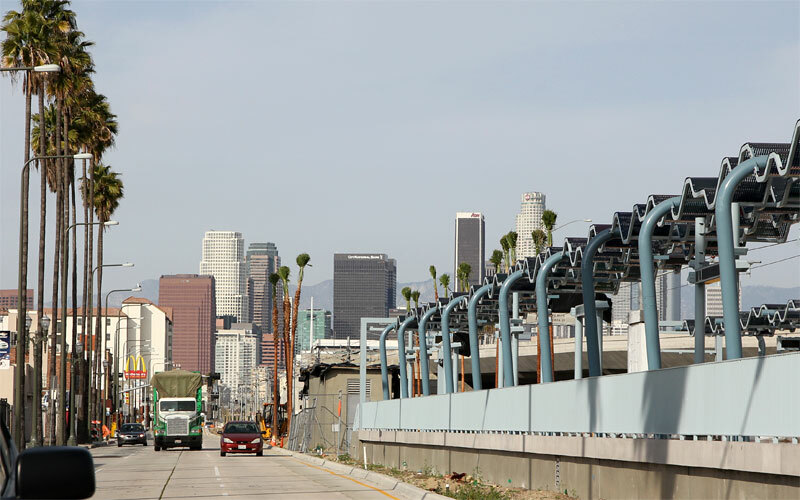 The last OCS section is finally being installed, with the messenger (upper) wire now through the underpass between Jefferson and Trousdale (below). 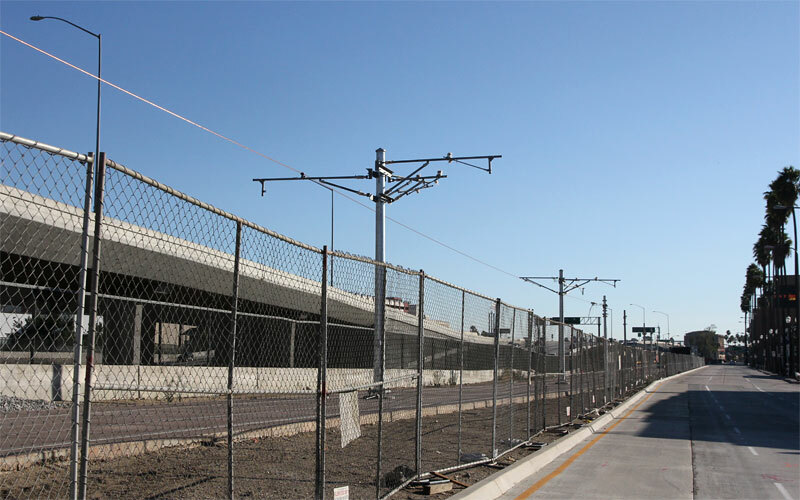 1/9/11 — Looking south toward the Jefferson station the construction fencing is down and the landscape strip is taking shape (above). 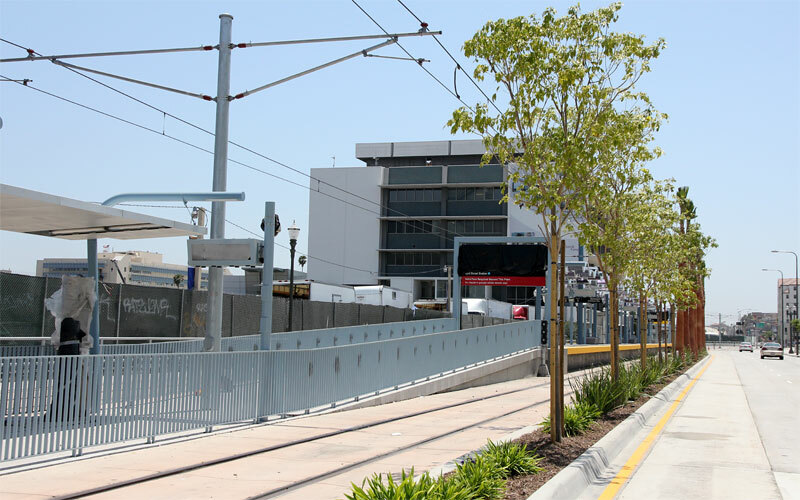 Looking north, the Jefferson station appears pretty finished (below). 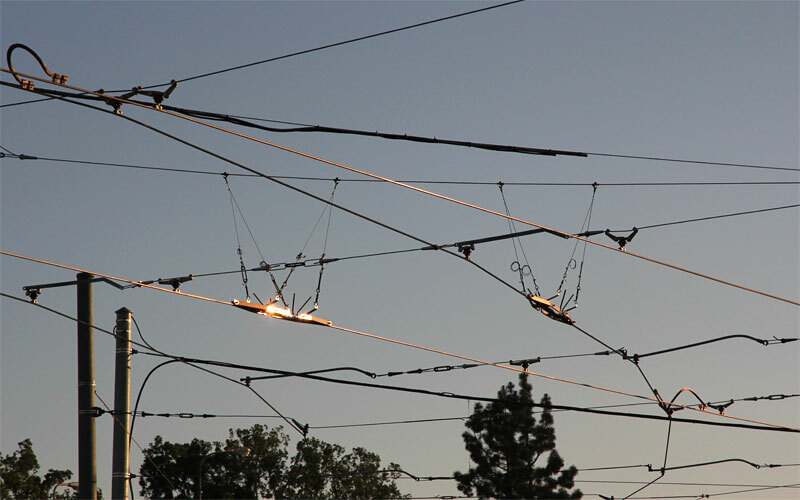 11/16/10 — Here's an arty shot of the late sun on the overhead at Washington and Flower, including insulated joints on two contact wires. 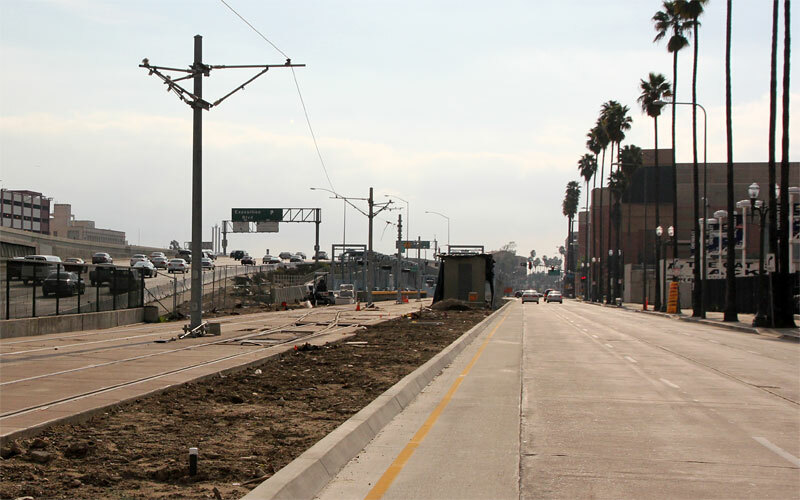 10/4/10 — The final rail gap (on Flower just north of Washington) was filled (above); rails are now continuous from the Blue Line to Culver City! 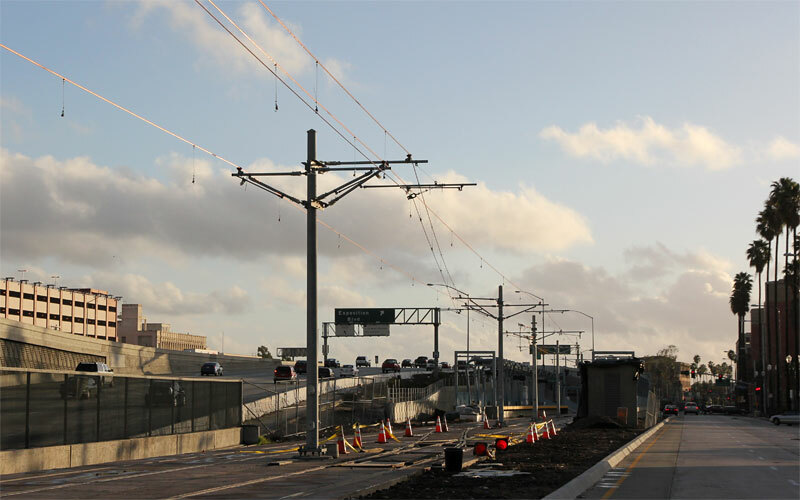 Catenary contact wire was hung below the messenger wire from the previous weekend (below). 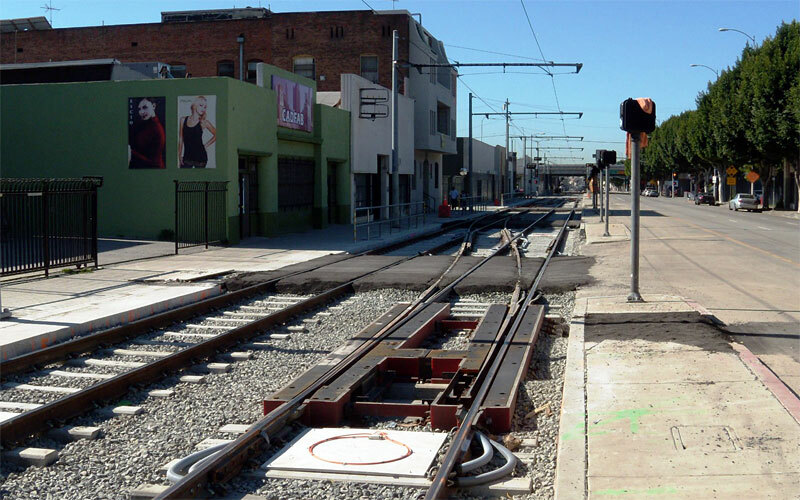 Note how the wires diverge — messenger wires diagonal left to anchoring poles, contact wires straight to the Blue Line tracks, supported by other wires spanning the intersection and finally anchored on the right (lower photo). 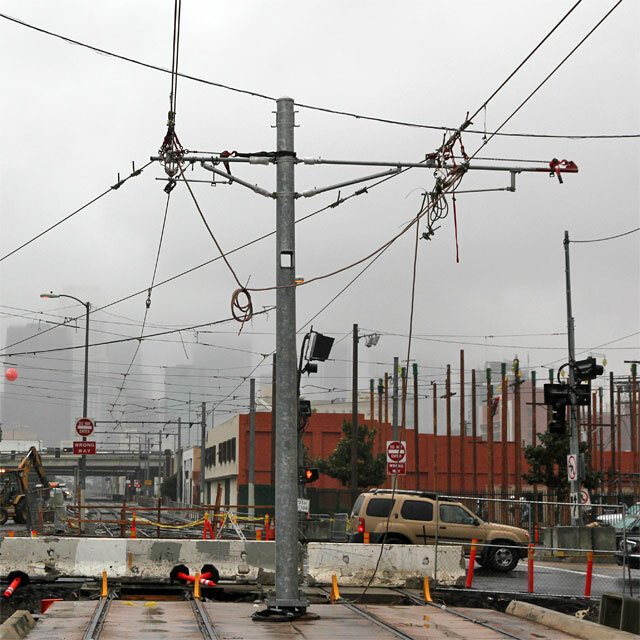 9/26/10 — The Blue Line was closed on the weekend, and messenger wire (the upper wire in catenary) is now strung along Flower from north of Washington to south of 30th Street (below). 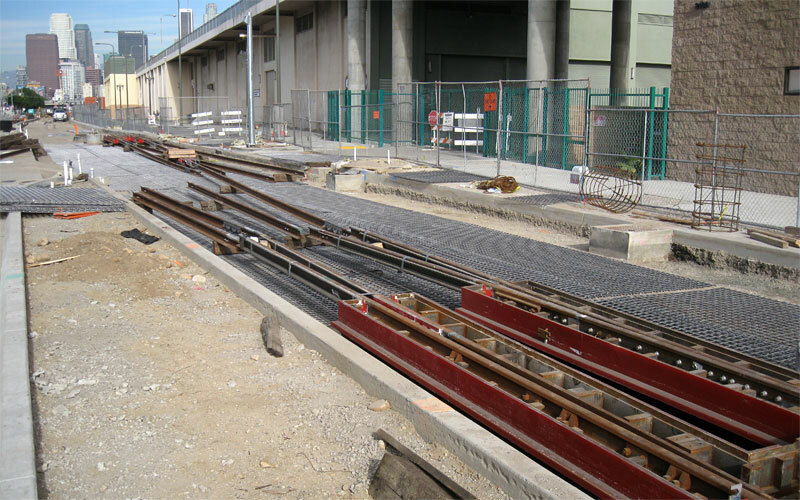 The wire junction with the Blue Line will be complex. 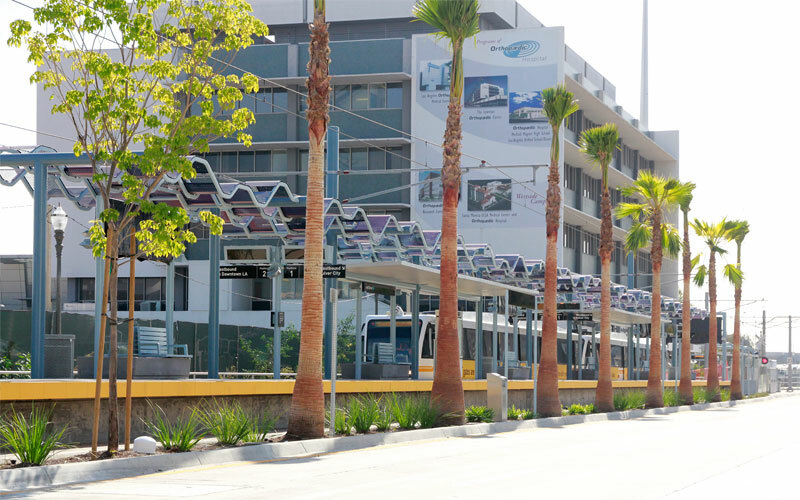 9/10/10 — OCS poles are about complete all the way from Washington Blvd. 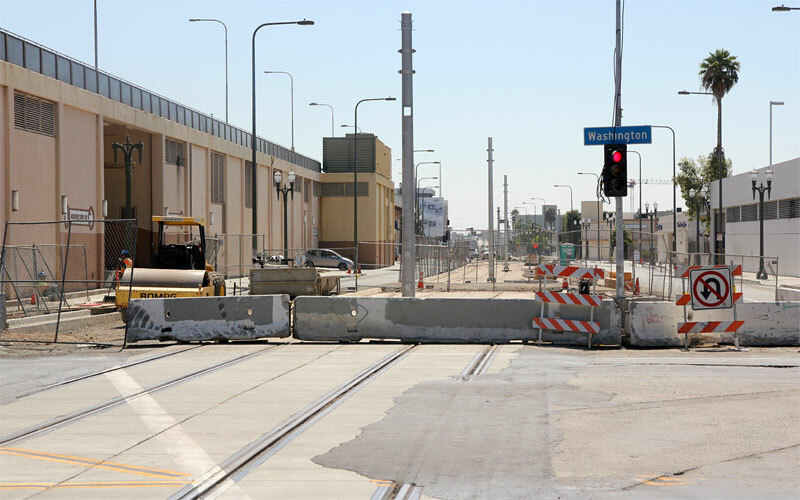 (above) to Culver City, and with track installed across Farmdale Ave. this week, this is the only remaining rail gap (below) between the Blue Line and Culver City. 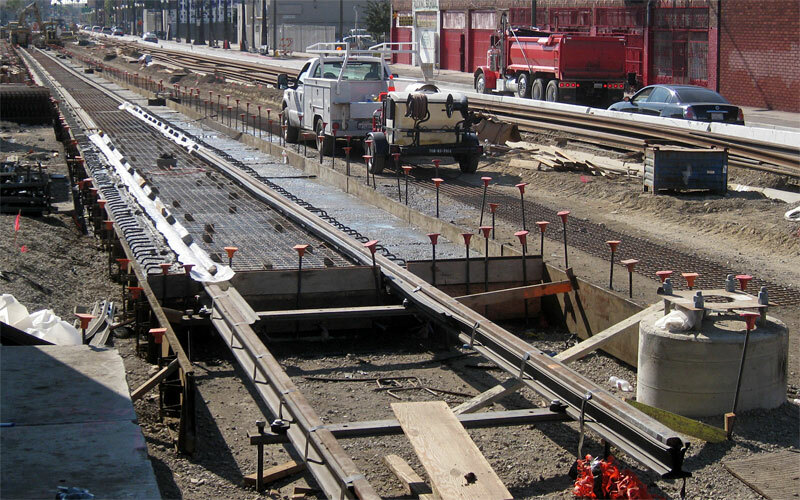 8/28/10 — Concrete-embedded rails were completed across Washington Blvd. today! 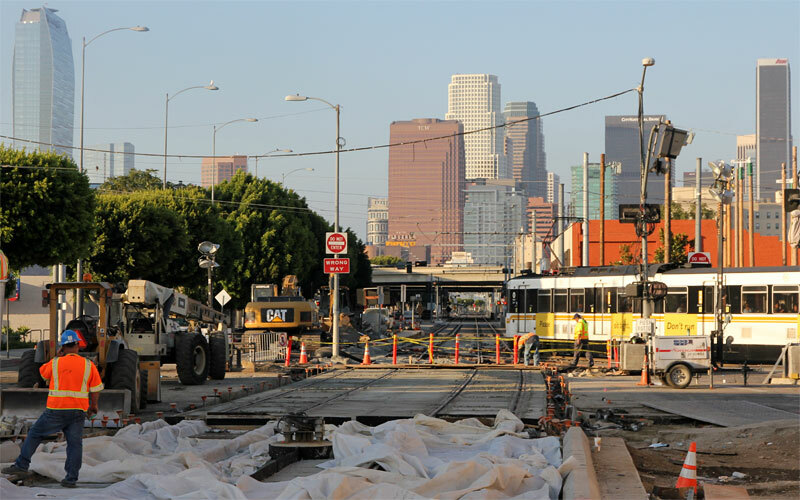 8/27/10 — The intersection of Flower and Washington is closed for three days (Friday-Sunday) to lay finally lay the tracks and install the grade crossing here. 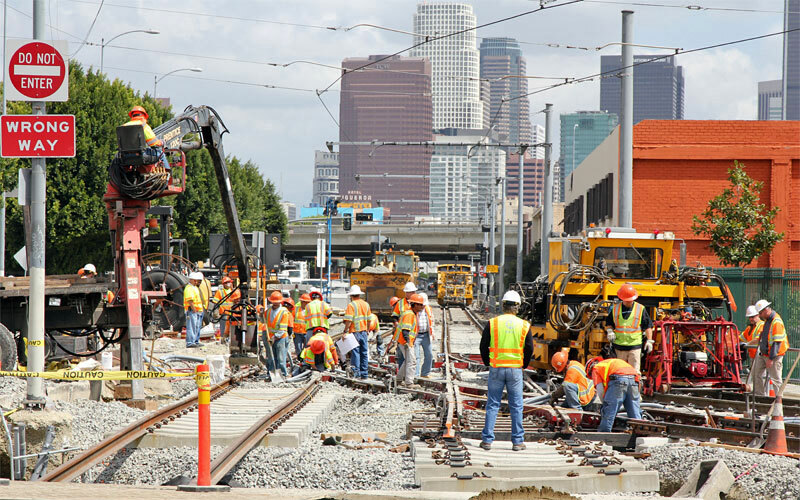 The first day they'd already finished cutting the basic trackbed and wrapped by mid-afternoon. 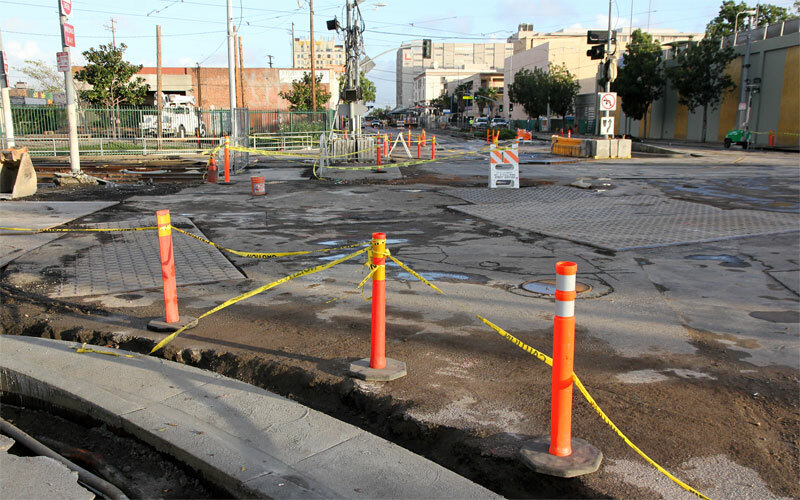 8/20/10 — Just this small gap remains south of Washington Boulevard on Flower Street, and its utility excavation appears complete. 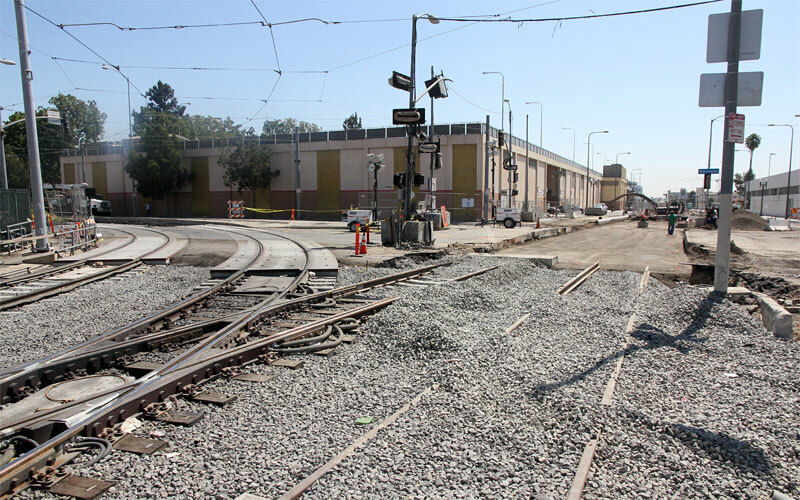 5/23/10 — The view north from Jefferson shows nearly-finished embedded track and the station construction (above). 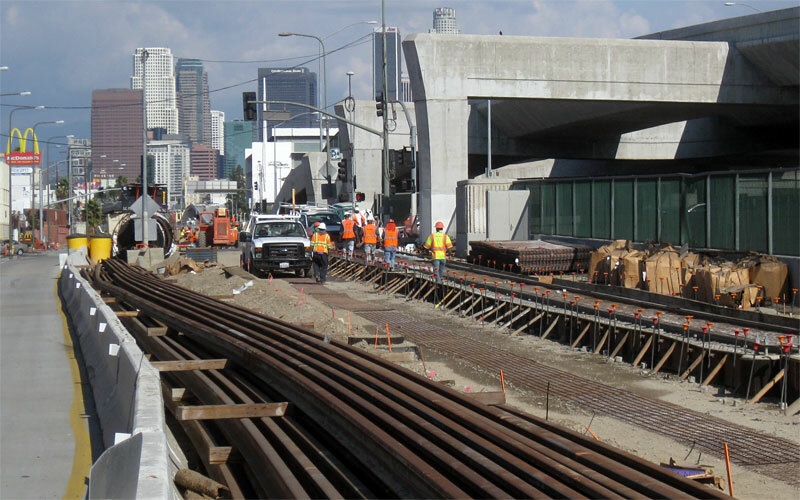 The last section of track to be built west of Buckingham is this one south of 23rd (below); rails are finished over the freeway bridge. 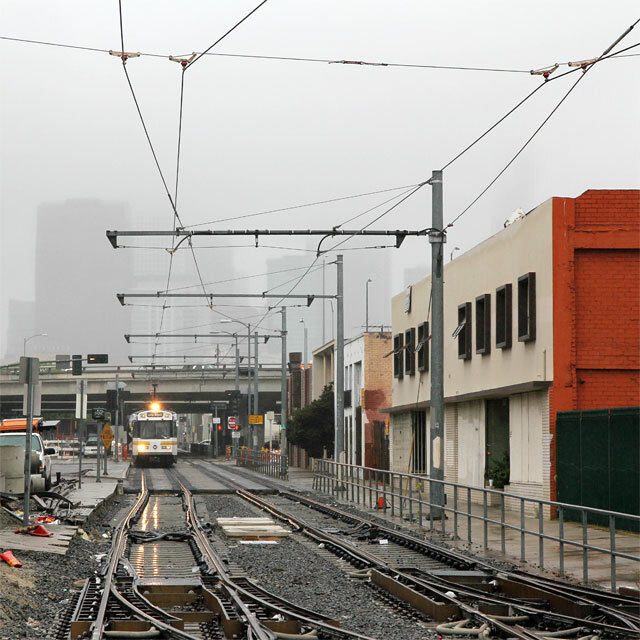 4/4/10  The two track switches and crossing necessary for the Expo Line to branch from the Blue Line were installed this weekend. 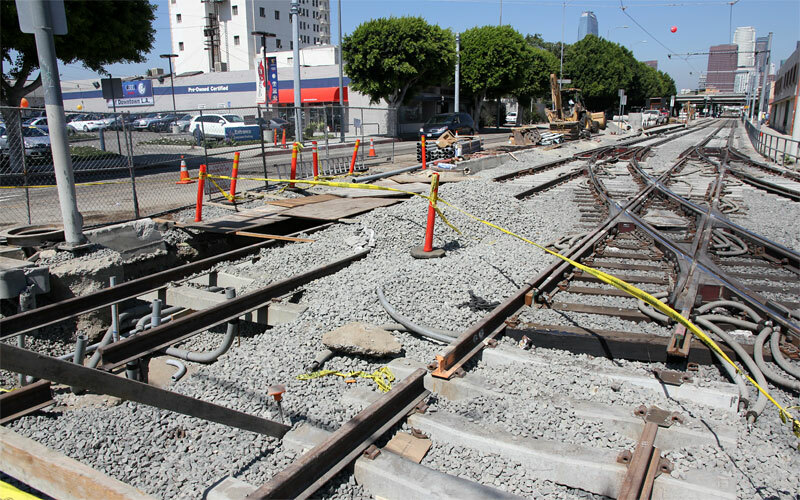 The tracks don't yet cross Washington Blvd., though. 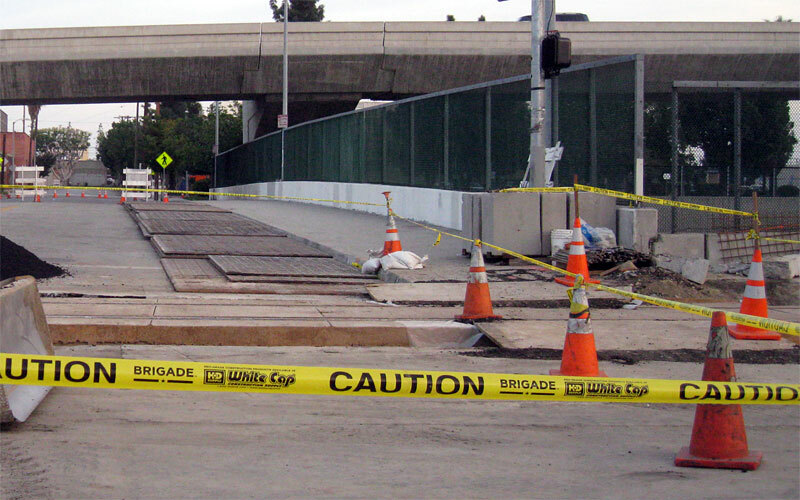 3/17/10  Above is the new pair of track crossovers on Flower Street north of Venice Blvd. installed over the weekend. 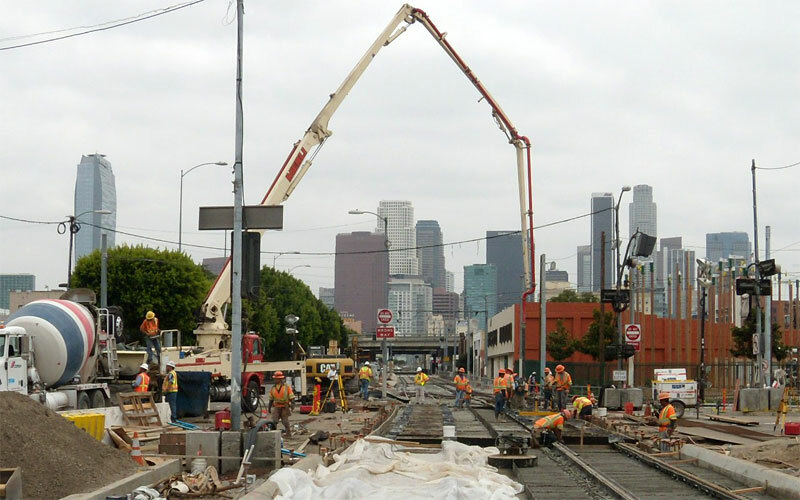 Weekday night work also continues, with Blue Line trains running on one track while crews reboot the rails on the other track south of Pico (below). 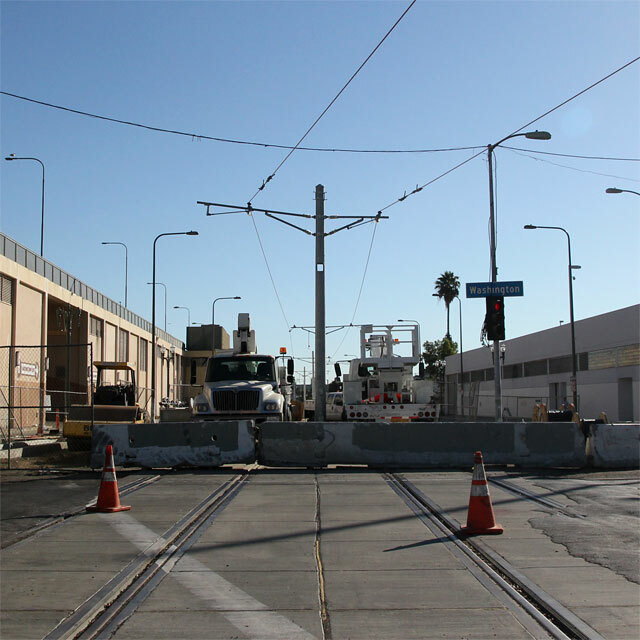 1/31/10  Embedded-track grade crossings are complete at 21st, 22nd, 23rd, 28th (one of two tracks, above), and 30th Streets, and Jefferson Boulevard, leaving only Adams and Washington Boulevards along Flower Street. 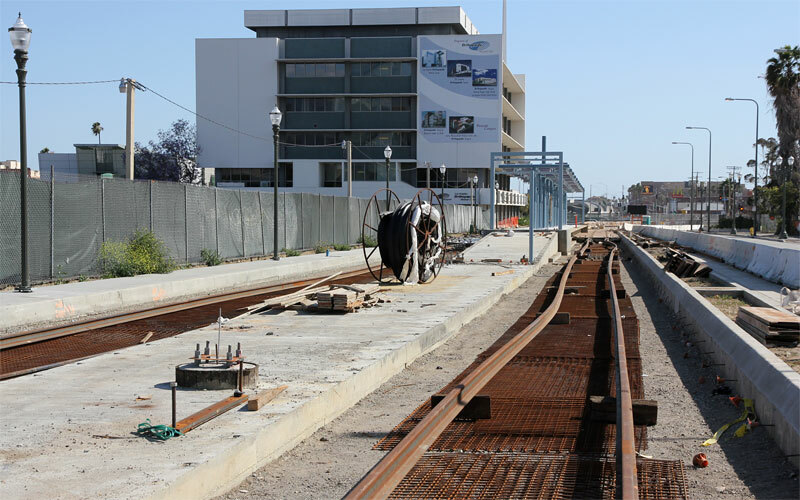 1/10/10  Special trackwork for a crossover's switches will be part of the embedded track by Trade Tech. 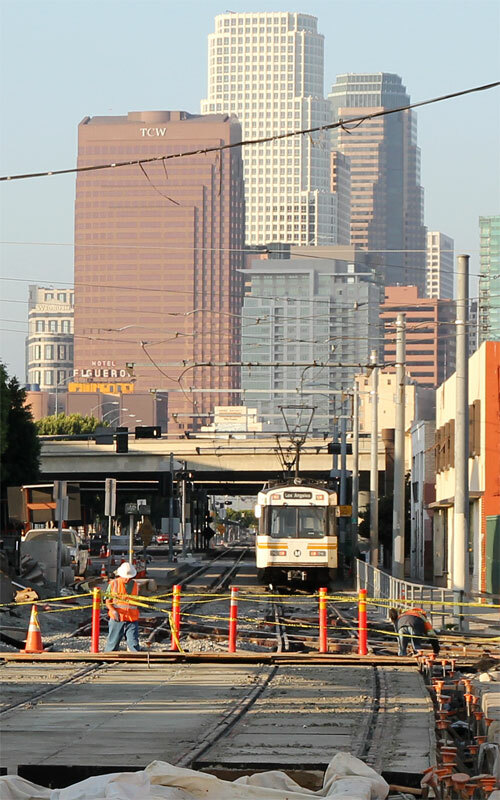 11/22/09  The intersection of Flower and Washington was closed this weekend to replace a section of the Blue Line with new ties-on-ballast tracks, in preparation for adding the branch for the Expo Line farther down Flower. 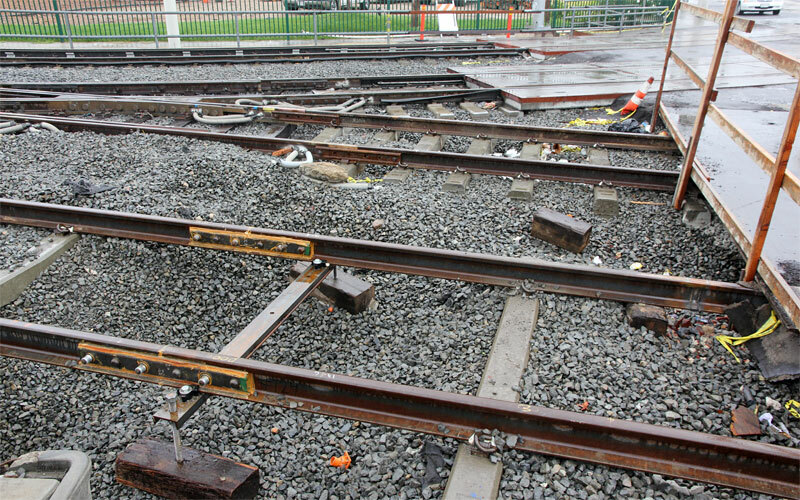 The section on wood ties (behind the concrete tie hanging from the crane) appears intended to be replaced with future track switches. 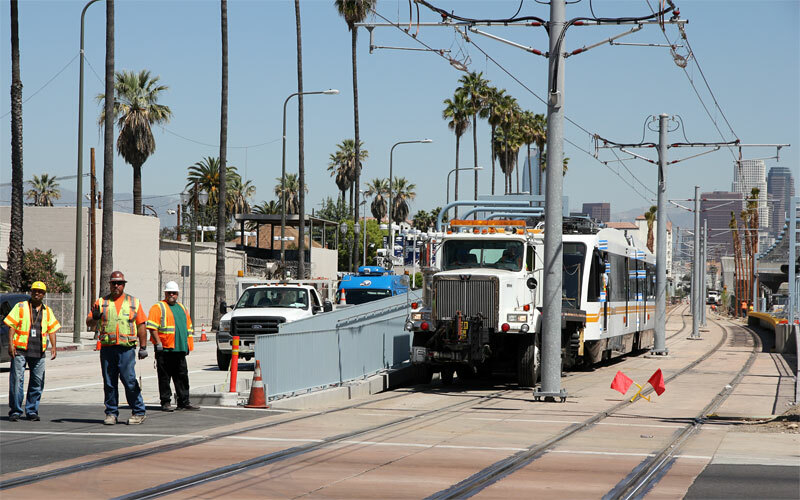 Blue Line trains were running on the new track Monday morning  but only after morning rush hour. Click for a before photo. 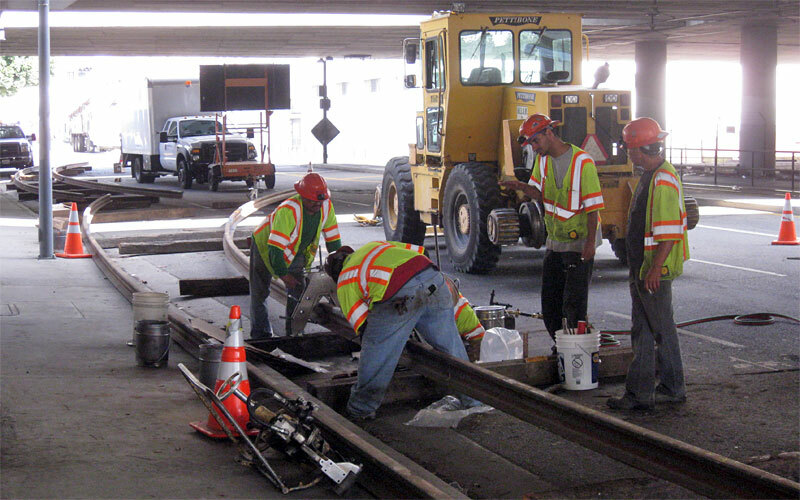 11/21/09  Here's the demolition of the Blue Line track west of the Grand Ave. station (above) and new curved rails being welded together (below) Saturday, the day before. 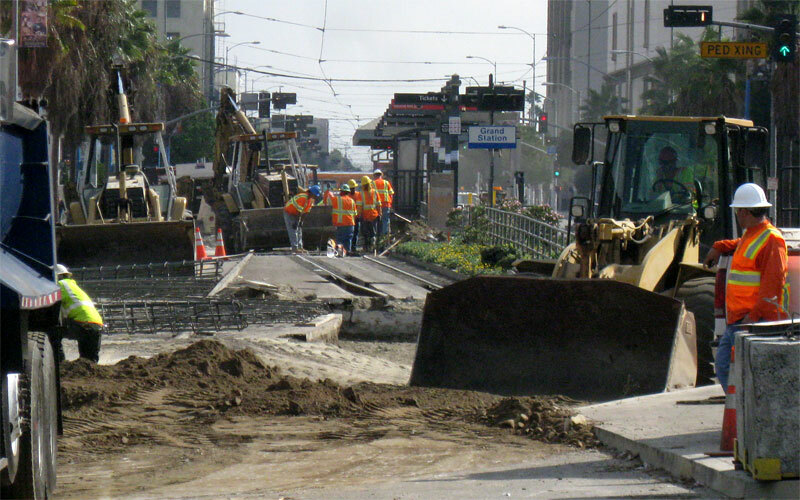 11/13/09  The first embedded track is being built north and south of 30th Street. 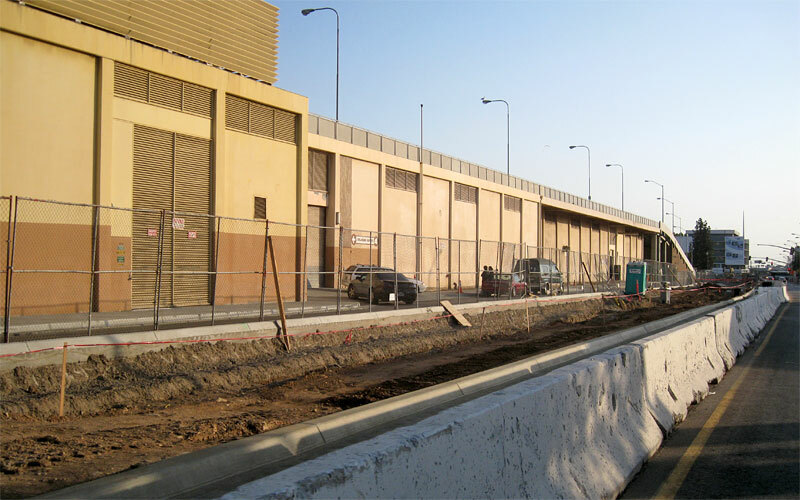 10/7/09  The access lane to serve the L.A. Trade Tech Flower Street garage entrances is finished (behind the temporary chain link fence), and you can see the dirt strip between curbs where the Expo tracks will go. 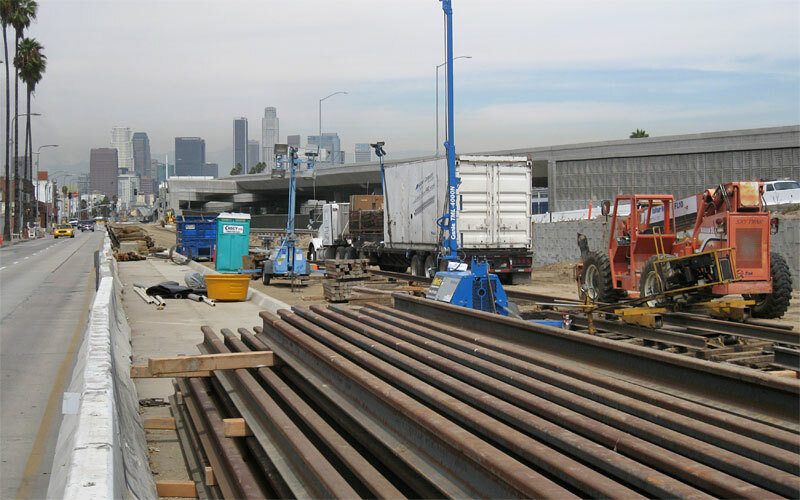 8/28/09  Rails are being welded together north of Jefferson, like west of La Brea a few months ago. The background is smoke from the Station Fire in the Angeles National Forest. 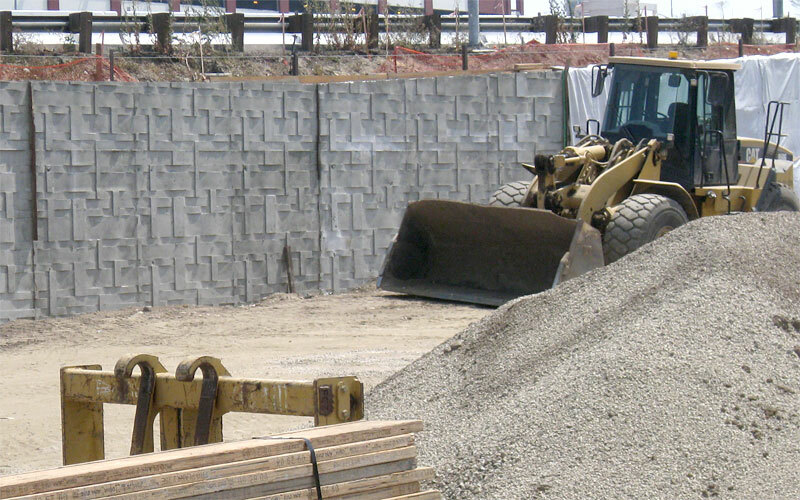 8/16/09  The weaving-pattern retaining wall behind the Jefferson station on Flower is complete. 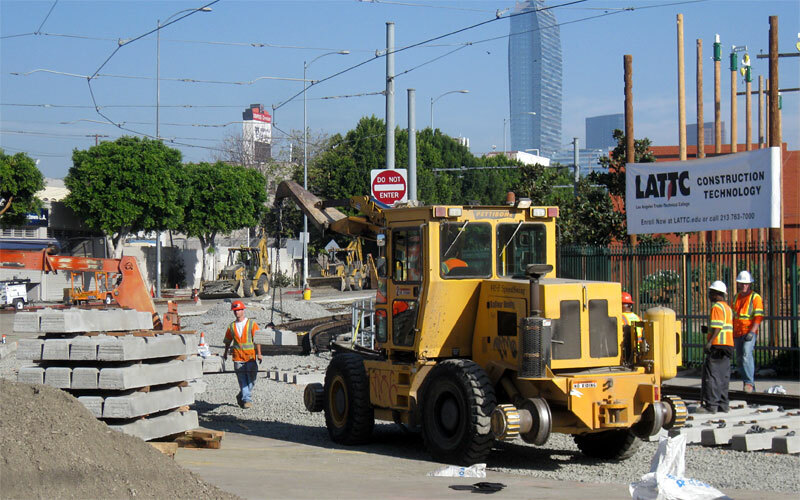 8/11/09  The foundation for the station at 23rd Street is beginning. 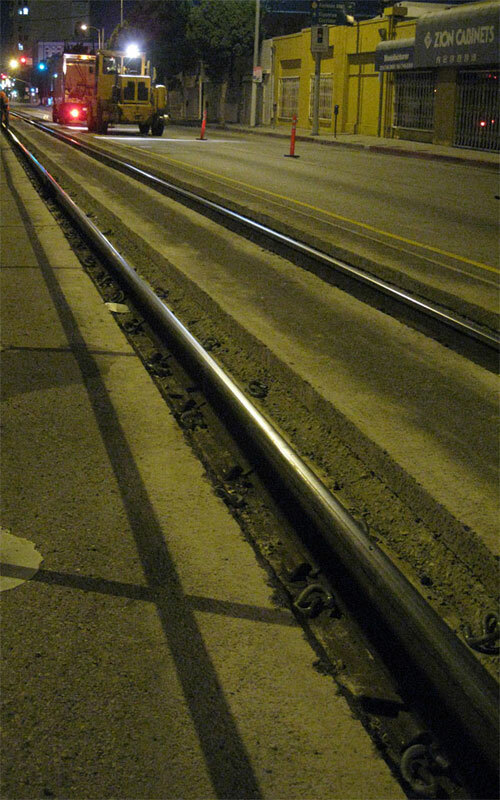 8/6/09  Night work is being done on the Blue Line track on Washington and Flower, replacing the rubber boot around the rails. 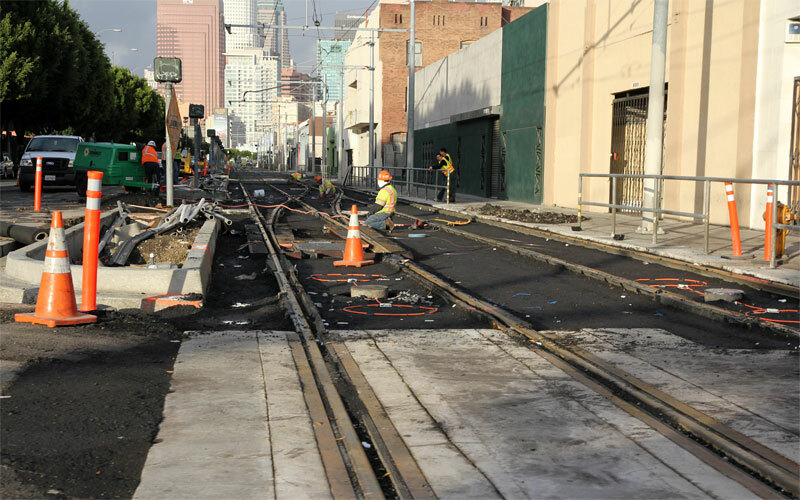 This is on Washington, west of the San Pedro station; the Blue Line was single-tracking on the south side, and workers were on the north side. 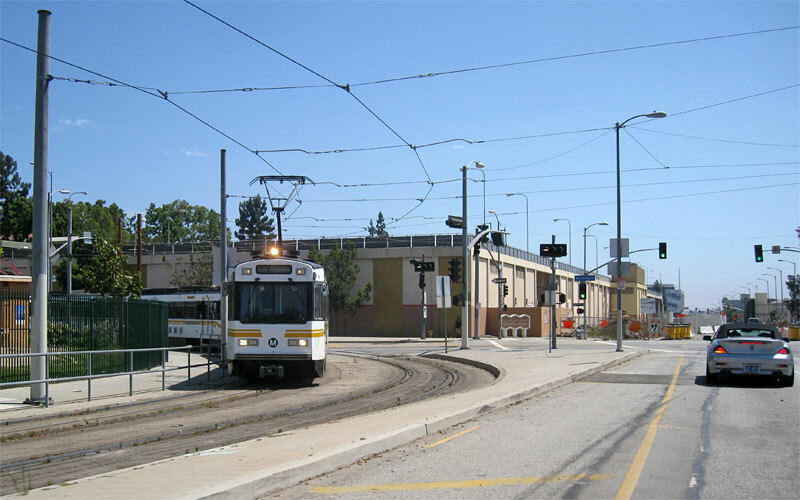 7/3/09  The Expo Line tracks will branch from the Blue Line here to continue south across Washington Blvd., passing Los Angeles Trade Technical College (center). 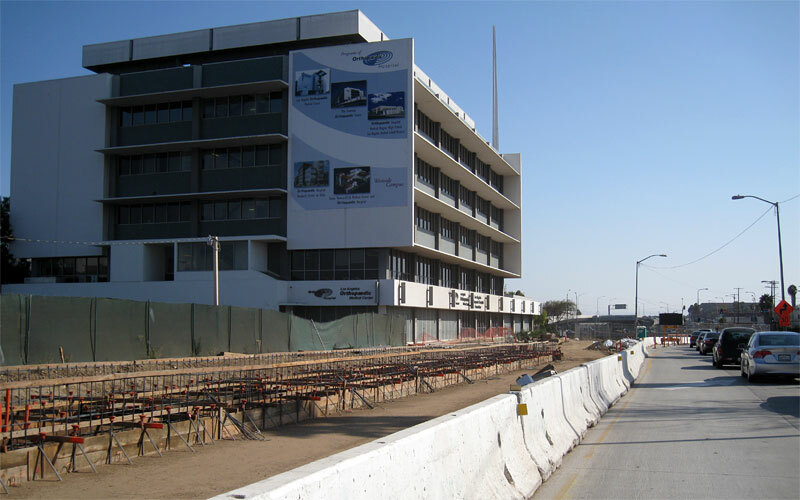 7/24/07  This before photo looks south on Flower Street, north of Jefferson Blvd. 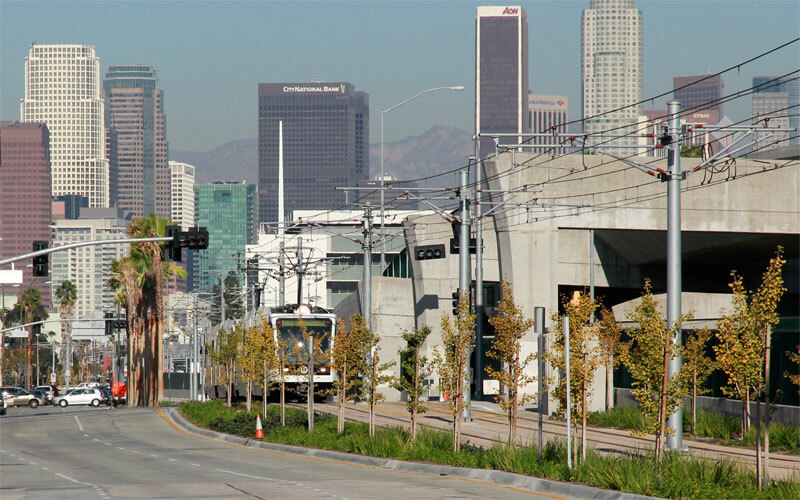 The Harbor Freeway and future Jefferson station site are on the left; USC's new Galen Center is on the far right. 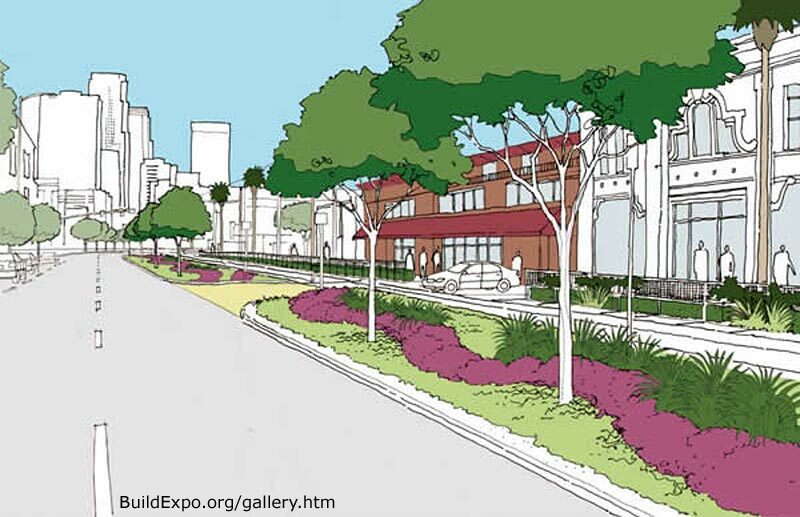 This Expo Authority sketch shows landscaping to be added to the existing Blue Line tracks along Flower Street, looking north. 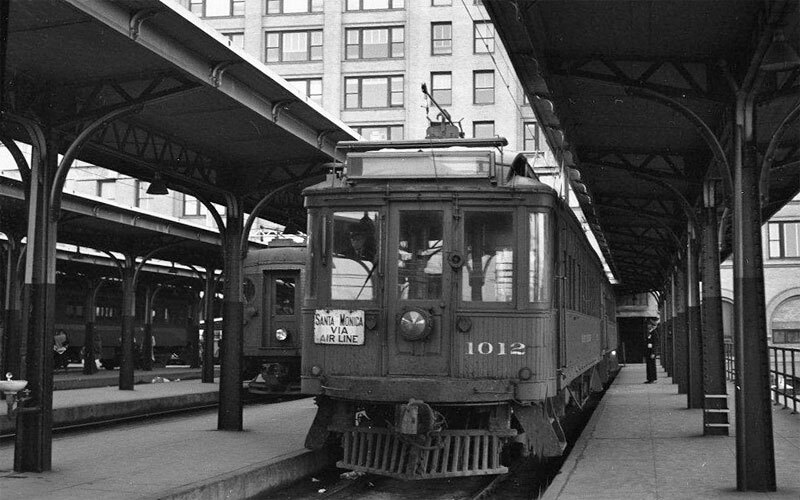 This photo is of Air Line car #1012 waiting in the Pacific Electric's old 6th and Main downtown depot, probably between 1947 and 1950 (Raymond E. Younghans collection, ERHASC/OERM; photographer not known).